Hyperactive Bob, the kitchen production management computer system from Hyperactive Technologies, is now being licensed to Zaxby's, a fast-food restaurant chain with locations in the Southern states. Zaxby's has 330 counter-service chicken specialty restaurants. This artificially intelligent computer system not only takes orders, it gives them as well. The system uses robotic vision to count the cars in the parking lot, gathers feedback from employees and collects point-of-sale information in real time. Hyperactive Bob analyzes historical and real-time data to learn about each restaurant individually. Hyperactive Technologies claims that HB is more accurate than most seasoned employees. 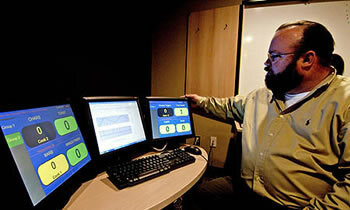 Hyperactive Bob uses touch screens to tell employees what to do. Employees are instructed how much of which foods to cook; when the food is ready, they tell HB. Hyperactive Bob operates on practical PC hardware and Windows .Net, Winnov Videum 4400 VO (4 channel video capture card), ELO Touch Screen Displays and Color 380 TV Line Cameras . According to the company, HB "leverages existing QSR infrastructure to offer a very low total cost of ownership, with little maintenance or support, and provides an accelerated return-on-investment that is realized in less than one year." Hyperactive Bob is frighteningly close to Manna, a science-fictional system proposed by Marshall Brain in his novella-length story of the same name. In the story, Manna is a PC-based system that makes use of sensors around the restaurant to gain information; it then instructs employees. If you think that going through your day with a computer telling you what to do every minute sounds creepy, it gets much worse. In the story, human workers are really just the remote "manipulators" and "sensors" of the system. Hopefully, no one will tell the makers of Hyperactive Bob about the Manna story; it has too many practical suggestions for the enslavement of humans. Visit Hyperactive Technologies.